Help stress test Blizzard's servers with a three-day demon kill-a-thon. 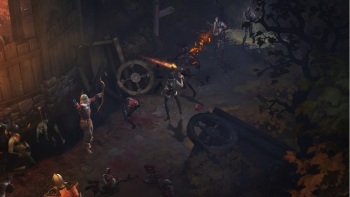 Up until now, the lands of Sanctuary have had a decently strict immigration policy, but with a May 15th full release date fast approaching, special beta keys be damned; Blizzard is opening up Diablo 3 to everyone with an internet connection for exactly 69 hours and 59 minutes. Would-be Witch Doctors and Demon Hunters everywhere, rejoice! If you want to take part in the weekend madness, head over to Battle.net and start downloading the client. Then, beginning today at 12:01 P.M. PDT, you can grind a character all the way up to level 13 until Monday, April 23 at 10:00 A.M. PDT. During this window you'll have access to all five classes, and be able to team up with and join friends in an, admittedly, abbreviated quest to save the world from the forces of doom. Is there a catch? Not really. You're going to need to have a Battle.net account and a "BattleTag", but both can be created for free right here. Other than that, just try to make sure you aren't in Korea. Sorry Seoulers, due to some regional differences and the stress test client, you'll need to wait a bit longer before diving in with the rest of the world. Everyone else on the planet is a-okay, so if you can't see Changdeokgung Palace from your window, you're probably golden. Get playing!